Metra Electric service resumed Monday after last week’s freight train derailment damaged commuter train infrastructure, causing a four-day suspension of service. Trains were running a modified schedule. Metra Spokesperson Meg Thomas-Reile said full service to the Homewood and Flossmoor stations will continue to be on a modified schedule through the rest of the week. A CN freight train derailment happened near the Metra station in Harvey late Wednesday night, Jan. 30. The derailment toppled one of the columns supporting a structure that bridged the tracks and held up the wire system, Thomas-Reile said. The structure collapsed over the tracks and pulled down more than a mile of the wires that feed power to two of the four tracks. All tracks were blocked by the damage, she said. The resulting power surge also damaged electric substations at Harvey and at Vollmer Road. The extraordinarily cold weather lengthened the disruption, Thomas-Reile said. “Due to the extreme cold, the overhead wires that power the trains were contracted. A certain amount of contraction of the wires in cold weather is normal and expected, but the cold last week was not normal and exceeded the tolerances built into the system,” she said. That contraction pulled the wires too high, Thomas-Reile said. The metal arms which rise automatically to meet the wires and draw power for the train, called pantographs, struck and damaged anchors that hold the wires and components of the signal system. Repairs are ongoing. A pair of cranes were used to hold the damaged structure in place while the remaining wires were secured. “This was a time-consuming process to ensure that we suffered no additional damage to the wire system, which is under tension and could snap if put under too much additional stress,” Thomas-Reile said. 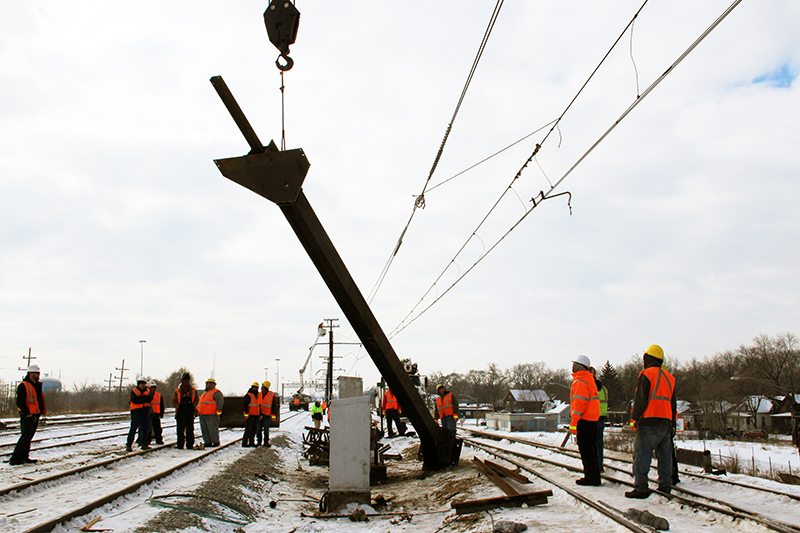 Once the wires were secured, the damaged support was lifted onto a flatbed railcar and removed. The new structure was then bolted into place and wires were connected. Sections of wire that were damaged beyond repair were restrung. 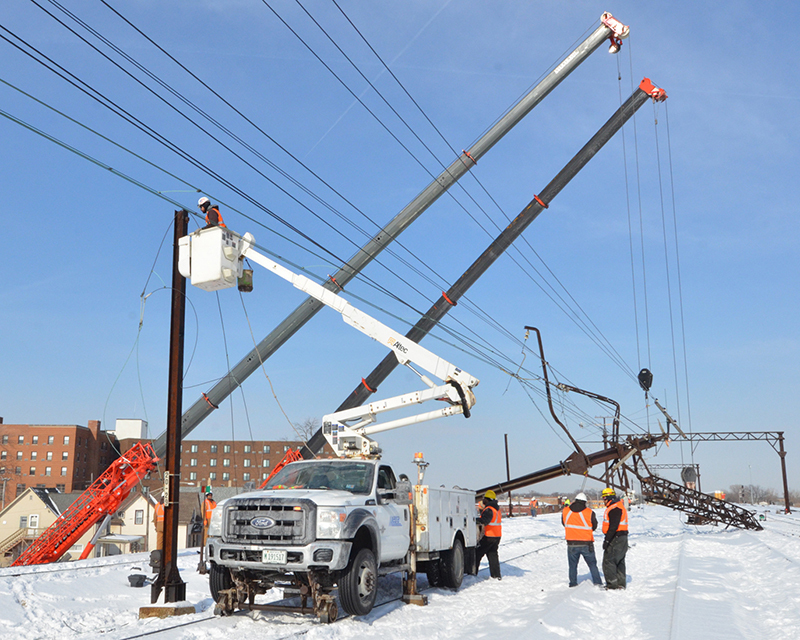 Crews also had to inspect the lines from Kensington south for any damage caused by the derailment or the cold. Crews are still working on restoring service to the other tracks. “We focused on getting one track operational so that we could at least provide some service south of Kensington," on Monday, Feb. 4, Thomas-Reile said. Thomas-Reile said the last disruption of a similar length was in June 2003 when a bridge burned in Riverdale. Service was shut down for nine days while a new bridge was built and passengers south of Riverdale were shuttled to the Rock Island Line.